PVC cement bonds PVC pipe and its fittings in a way that is more accurately called a weld, than a cement or glue. PVC cement contains a solvent, usually methyl ethyl ketone that breaks down the top layer of plastic on both the fitting and the pipe. Once the two pieces are placed together, the cement dries, fusing the two pieces together permanently. PVC pipe should be dry fit first, as once it is cemented it cannot be separated. Once two pieces of PVC have been cemented together, they are essentially welded into a single piece. Removal requires cutting, either at the sight of the cementing or further up the pipe, and replacing the fittings and pipe. There is no chemical solvent that will soften the cement and leave the pipe and fittings intact. If there is excess PVC cement oozing out from between a glued joint, it can be removed while still wet with a damp rag. Be careful not to smear the cement on to the rest of the pipe or fitting, as it can weaken PVC where it comes in contact with the plastic. If dried excess cement is a problem, use fine grit sandpaper to carefully remove it. Cementing PVC pipes and fittings can be messy business. If some excess PVC cement has spilled on non-PVC materials, such as flooring or wooden cabinet bases, it can be removed using a putty knife or fine grit sandpaper. A razor may also be used to carefully scrape the glue off of the surface. PVC cement application should be considered akin to spot welding two materials together. For all intents and purposes, once PVC cement has been applied and the two pieces have been joined, they are joined permanently. 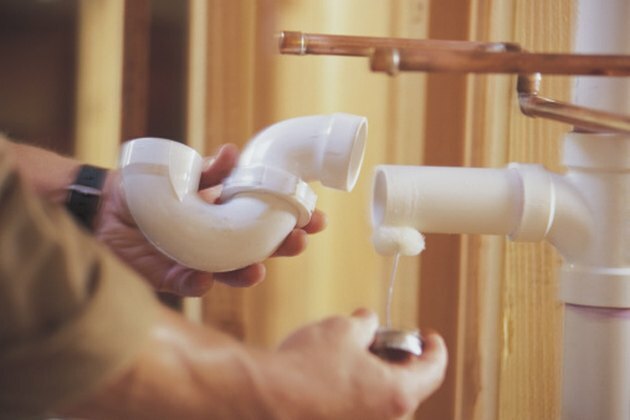 To avoid issues involving PVC cement, always measure your pipes and fittings twice. Wherever possible, dry fit your pipe in its intended installation before applying any cement, to ensure all pieces have been cut correctly.